All the kennels have recently been painted and a lot of the sofas changed. We're in the process of painting the cattery, we're adding some colour over there! Photos to be added soon! It's time to start thinking about holidays for 2019. make sure you book your furbabies in early as we are already getting booked up! We had 3 baby peacocks hatch in August, they are growing bigger by the day and we should hopefully know soon if they are boys or girls! 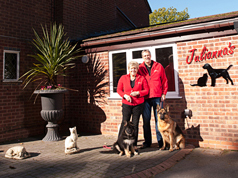 We love to make your pets feel as at home as possible during their stay with us. We have a facebook page so you can see photos and videos of what your pets are getting up to during their stay! Search juliannas kennels and cattery on facebook and like our page!